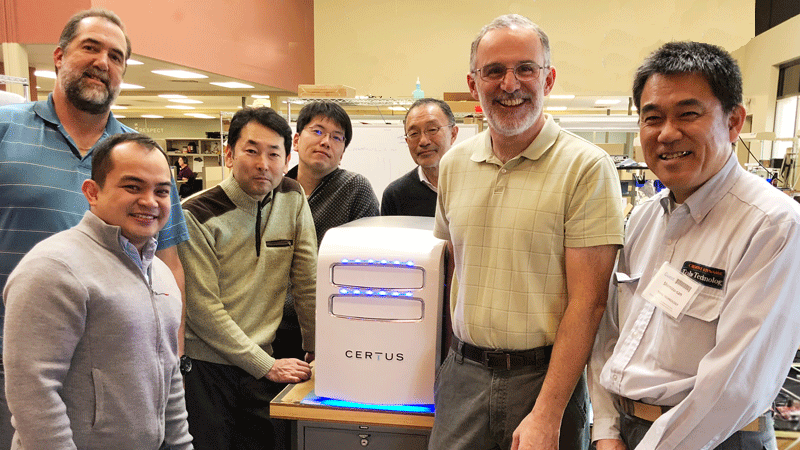 CHICAGO – February 13, 2018 – CERTUS, innovators in food safety technologies, has begun manufacturing of the CERTUS System Detection Unit, bringing small and mid-sized food processing plants one step closer to a fast, easy and cost-effective way to detect pathogens. Based on SERS nanoparticle technology made available through an exclusive license agreement with BD (Becton, Dickinson and Company), a leading global medical technology company, the CERTUS System is an entirely in-house system, enabling food producers to perform environmental monitoring without the need for outsourced testing. With the commencement of manufacturing, the CERTUS System Detection Unit is on track for market availability in June 2018. Toho engineer makes final adjustments on CERTUS Detection Unit. Manufacturing of the Detection Unit is being carried out at CERTUS’ parent company and iconic precision manufacturer Toho Technology. Founded in 1819 in Nagoya, Japan, Toho is a privately-held company that provides engineering, manufacture, distribution, and support of diverse industrial and life-science technologies to customers around the world. With a well-established global market presence in optical instrumentation in the fields of semiconductor, flat panel display, and process engineering, CERTUS leverages the Toho team and talent to advance out of R&D and into full-scale commercial production. In addition to partnering with Toho, CERTUS works with United Kingdom-based Solus Scientific for assay development. “One of the reasons we chose to partner with Solus is because of their efficient research and development track record on bringing to market a range of assays in the area of food safety testing,” continued Bodner. The CERTUS Listeria El assay was developed in collaboration with Solus in 2017, while the environmental Salmonella assay is currently under development and expected to be available for use in the CERTUS System as early as Q4 of this year. The CERTUS System will be commercially available in June 2018 and will feature a simple workflow, Bio-Lock™ safety components and real-time monitoring for rapid results. For more information on CERTUS visit certusfoodsafety.com. CERTUS changes the way food safety testing is done and helps reduce food-borne illness with a new generation of food pathogen detection devices and processes that are precise, affordable and easy to use. Making rapid pathogen detection and prevention Simple, Safe and Smart, CERTUS is built on the foundations of empowerment, simplicity, precision, and integrity. CERTUS seeks to integrate historically embraced values into future technology to bring innovation and expansive vision to the food safety industry. CERTUS joins the Toho Technology group of companies as a new brand specializing in Food Safety. Founded in 1819 in Nagoya, Japan, Toho is a privately-held company that provides engineering, manufacture, distribution, and support of diverse industrial and life-science technologies to customers around the world. With significant expertise in precision instrumentation and equipment sales, Toho Technology advances the way products are made, tested and verified within the fields of food safety, healthcare, and nanotechnologies. The company currently operates multiple facilities in Chicago, Illinois; Japan; Shanghai, China, and Jakarta, Indonesia. Toho Technology Inc. is the launch site for the CERTUS global expansion with all R&D, operations and sales centered in its Chicago location.